Help diagnose my sad indoor ficus tree? Hi all. I'm new to this forum. I signed up out of desperation in the hopes that someone here can help me save my ficus! Back in April, I moved this 14 ft tall ficus into my apartment from an office space where it was getting decidedly more light (though, as you can see in the pictures, my space gets a good deal of light itself). I expected it to drop some leaves right away from the move, but it did great until about a month a half ago when it started dropping leaves like crazy! The leaves turn yellow and fall off. I thought this might be due to overwatering, especially since I had a housesitter during that time who may have watered it overzealously. But I'm also concerned that it is not getting enough light, since San Francisco has been especially gloomy this summer. However, today I went to wash its leaves in hopes that cleaning the dust off the leaves would let it get more light, when I found some troubling symptoms. On the smaller (and more vulnerable) branches, the bark is peeling. I also found that many of the leaves have white flecks or black flecks at the spot where they join to the branch. I couldn't tell if these were part of the plant or not. Could it be some kind of pest or fungus? As far as the pot, some of the root system is peeking out the bottom of the pot - could it need repotting? I would appreciate any advice anyone has. I do not want this tree to die and right now it is looking rather bleak. I washed some of the leaves and sprayed the whole tree down with a mixture of rubbing alcohol and dish soap in hopes of combatting any beasties. The leaves are all very delicate and many came off in my hands. Sad. I am not an indoor plant person but moving mature plants from one environment to another will shock the plant and yes it could be too much watering. A couple times a week depending on the light is enough. It could be aphids but I am not certain but the only way to treat them as far as I know would be to cover the whole plant and then spray with whatever they suggest. Hopefully someone more experienced will give better insight. The pot certainly looks small and, while probably not causing the complete problem, is contributing to the overall stress. Remember that when trees are grown in the ground, their root systems are a similar size to their canopy. The bigger the better for this caliber of tree. 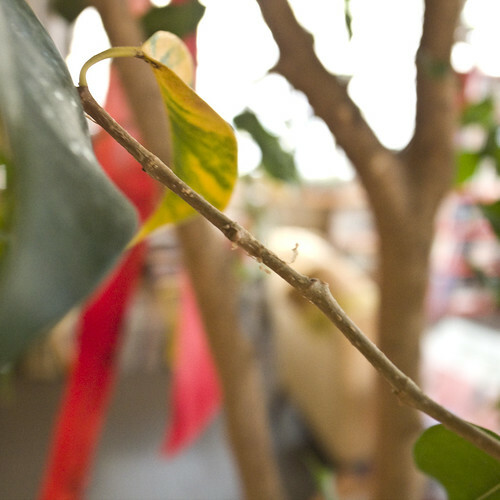 Ficus have a milky sap that will weep if the tree is damaged. This could be the substance in your pictures. 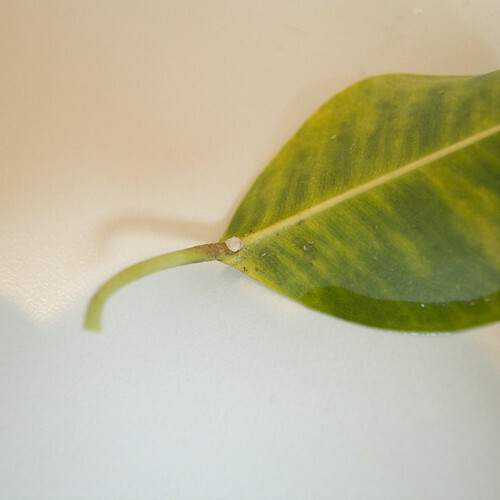 Since their leaf stems are rather fragile, damage can be caused by lots of things. Moving a tree that size certainly knocked some of the leaves around. Cleaning with anything but the most gentle feather duster can stress stems. The soap and alcohol that you used could be part of the problem if it wasn't rinsed well afterward. Too much wind from an open window can be an issue as well. 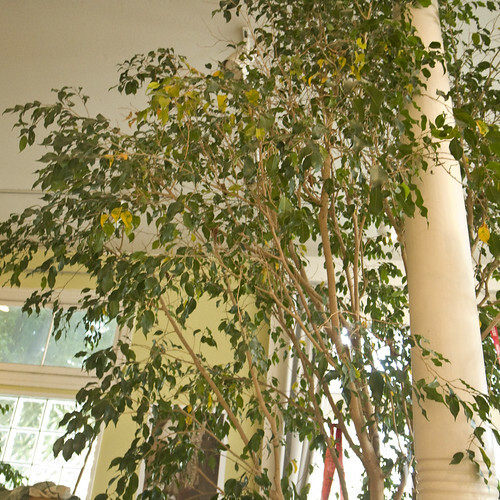 3 months is really not all that long for a ficus to acclimate to its new surroundings, especially if the watering schedule may have been sporadic. 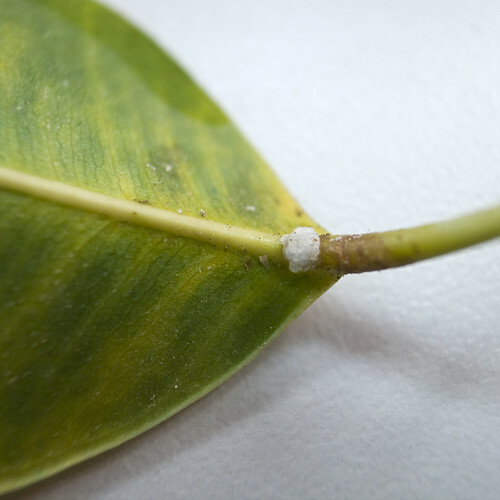 If you see no signs of pests (spider mites are a notorious bane of ficus), I'd try to get it into a new pot, get it on a good watering schedule, keep it out of drafts, give it strong light but not too much direct sun, and see what happens. 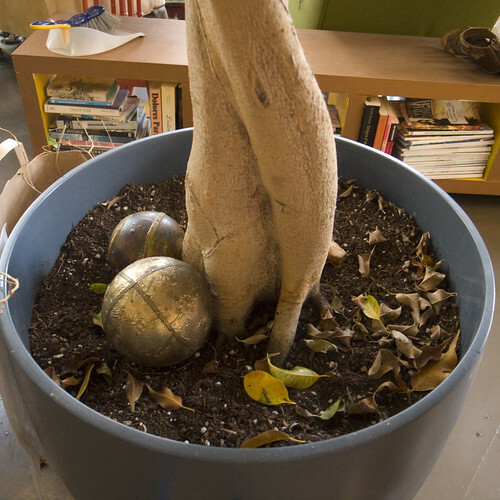 Until you know what's going on, try to keep fallen leaves out of the pot in case they have a disease or pest. You may also want to consider a pruning. Often does wonders for a stressed tree. Way back in college I had a job maintaining plants in office buildings, and have nursed a lot of ficuses (is that the right plural?) back from far worse shape than yours. Routine watering and good light are often the key. Ficus tree dead or dieing?